Can it be “tommyrot” when such people advocate Pelmanism? 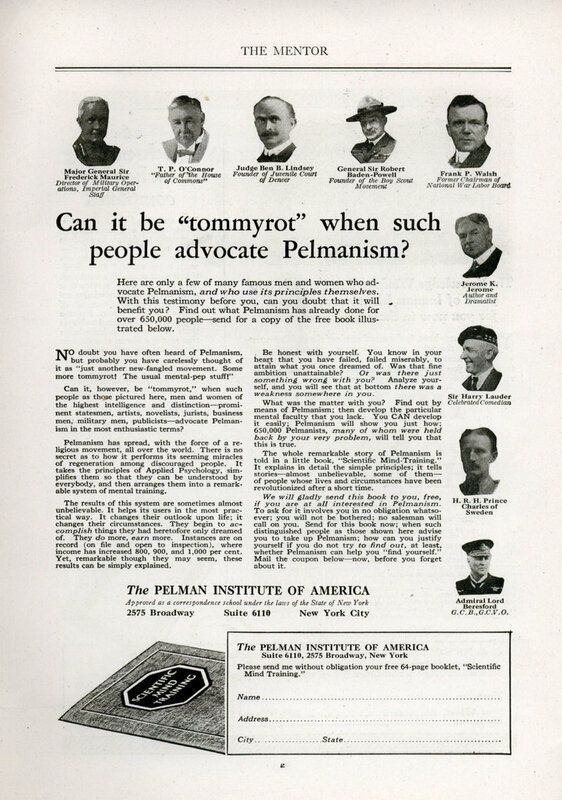 Here are only a few of many famous men and women who advocate Pelmanism, and who use its principles themselves. With this testimony before you, can you doubt that it will benefit you ? Find out what Pelmanism has already done for over 650,000 people—send for a copy of the free book illustrated below. Can it, however, be “tommyrot,” when such people as those pictured here, men and women of the highest intelligence and distinction—prominent statesmen, artists, novelists, jurists, business men, military men, publicists—advocate Pelmanism in the most enthusiastic terms? Pelmanism has spread, with the force of a religious movement, all over the world. There is no secret as to how it performs its seeming miracles of regeneration among discouraged people. It takes the principles of Applied Psychology, simplifies them so that they can be understood by everybody, and then arranges them into a remarkable system of mental training. The results of this system are sometimes almost unbelievable. It helps its users in the most practical way. It changes their outlook upon life; it changes their circumstances. They begin to accomplish things they had heretofore only dreamed of. They do more, earn more. Instances are on record (on file and open to inspection), where income has increased 800, 900, and 1,000 per cent. Yet, remarkable though they may seem, these results can be simply explained.
. Be honest with yourself. You know in your heart that you have failed, failed miserably, to attain what you once dreamed of. Was that fine ambition unattainable? Or was there just something wrong with you? Analyze yourself, and you will see that at bottom there was a weakness somewhere in you. What was the matter with you? 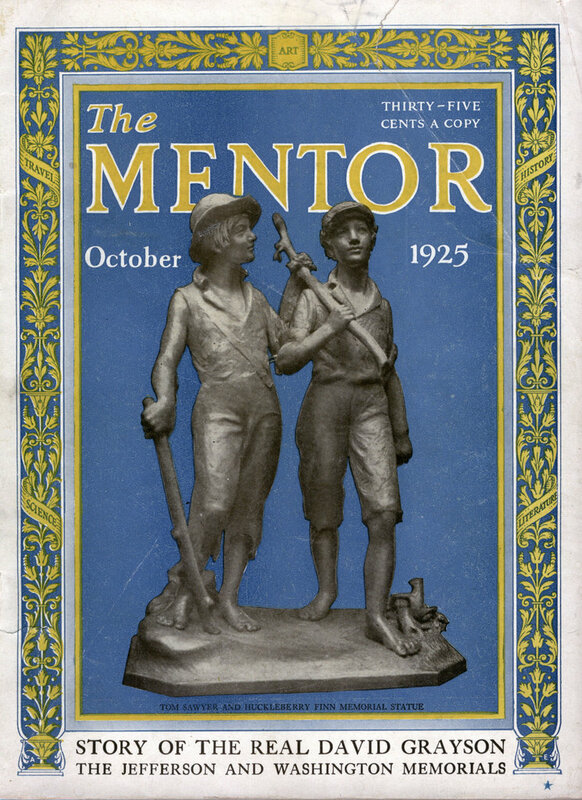 Find out by means of Pelmanism; then develop the particular mental faculty that you lack. You CAN develop it easily; Pelmanism will show you just how; 650,000 Pelmanists, many of whom were held back by your very problem, will tell you that this is true. The whole remarkable story of Pelmanism is told in a little book, “Scientific Mind-Training.” It explains in detail the simple principles; it tells stories—almost unbelievable, some of them— of people whose lives and circumstances have been revolutionized after a short time. We will gladly send this book to you, free, if you are at all interested in Pelmanism. To ask for it involves you in no obligation whatsoever; you will not be bothered; no salesman will call on you. Send for this book now; when such distinguished people as those shown here advise you to take up Pelmanism; how can you justify yourself if you do not try to find out, at least, whether Pelmanism can help you “find yourself.” Mail the coupon below—now, before you forget about it. Oh Charlie, here we go again! Pelmanism gave us the card game of “Concentration” too http://www.pagat.com/mi… (the Mayan Order can’t say that). Well, what can you say of something endorsed by Prince Charles of Sweden? Lord BP was into a lot of odd things, besides this. And I have a 78 of Harry Lauder, and have heard him on an Edison Cylinder, for that matter. never would have pegged him for this. Jerome K. Jerome, A&D* personally awards Pelmanism his personal approval seal of seal approval award! http://www.jacquielawso… has an online greeting-card version . . . .
From the results I’ve gotten from a web search, it seems pretty harmless, yet the way it’s expressed makes it sound like a scam designed to drain people of their life savings once they sign up for advanced training. This was the Pelman Institute’s expanded version that this guy has put up for anyone to read. Best cure for Pelmanism is sleeping with your hands above the covers. Please send the information on Pelmanism. Abdul: Who are you talking to?